In celebration of Fall ... and it being October and all, I decided I wanted to make something with pumpkin. It is seriously my favorite season. I love the way the leaves are changing. I love the way the air smells. I love that it's getting colder and I can finally wear my North Face again. These little raviolis are so delicious. It's definitely an unexpected and awesome way to use all that canned pumpkin in your pantry. I love the taste of toasted hazelnuts sprinkled over the top, but you can omit this if you want to. 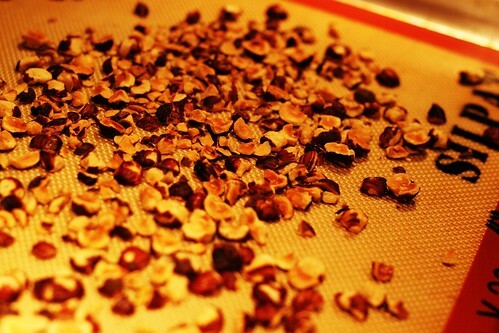 To toast hazelnuts, just chop them up and spread on a baking sheet. I baked these at 375 degrees for 4 or 5 minutes. Just pull them out of the oven when they start to smell really strong. If you don't use all the hazelnuts for this recipe ... save them! They are great on yogurt, ice cream or sprinkled over any cheesy pasta. To get the filling nice and thick, make sure you don't skip this step! 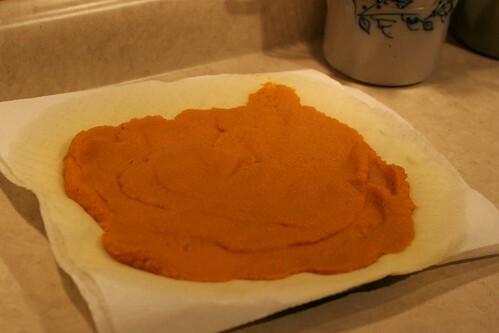 Put 4 paper towels on a plate, then spread 1 1/2 cups of canned pumpkin on the paper towels. See how the liquid from the pumpkin is seeping into the paper towel? That's what you want. Fresh sage from my Mama's garden. I love the way this smells. 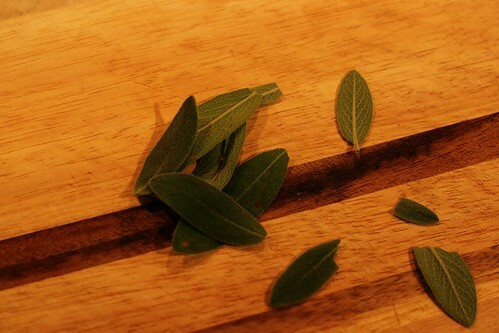 If you don't have fresh sage, you can use dried. Just use a little less than what the recipe calls for. These are all the ingredients for the ravioli filling. Clockwise from top: pepper, salt, fresh grated asiago cheese, fresh sage, grated nutmeg, cinnamon and breadcrumbs. Next comes pumpkin!! It's a little difficult to mix the filling together. Just keep working at it until it's all combined. 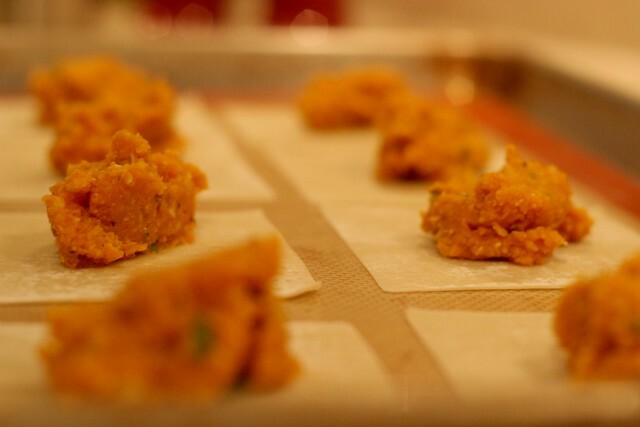 I used wonton wrappers for this, because it's much easier than making fresh pasta. I found wonton wrappers in the produce section of my local grocery store. Just put 2 or 3 teaspoons of filling in the middle of each wrapper. I used water to moisten the sides, then brought them together to form the ravioli. Oh, and do not taste the filling! Unless you're into that kinda thing. But I thought it was... not good by itself. Trust. A little water works really well to seal these shut. If you're having trouble, just moisten your fingertips and work around the edges. Look at those beauties! But you're really supposed to drop them in a big pot of boiling water. 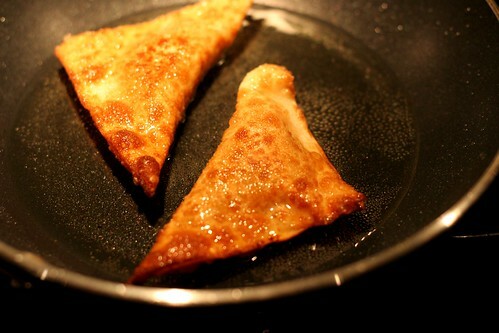 Trust me, they are better this way anyway, and you avoid all the fat from frying. Boil them in small batches. It only takes 4 or 5 minutes for them to cook, and you will know they are done when they float to the top. While the raviolis are cooking, it's time to make the creamy gorgonzola cheese sauce. YUM! It starts like any white sauce with milk and flour. Then you add butter and chunks of cheese. If you think you don't like gorgonzola cheese, you will in this sauce. Trust me. It's not a strong blue cheese flavor, just creamy and ridiculous. So here is the end result. 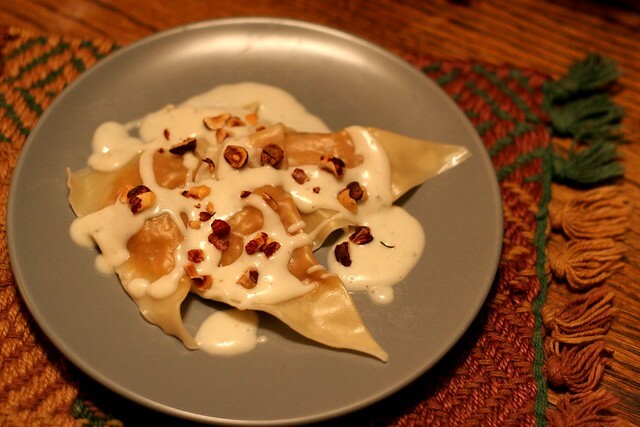 Light raviolis, stuffed with pumpkin, drizzled with gorgonzola cream sauce and topped with toasted hazelnuts. Spoon pumpkin onto several layers of heavy-duty paper towels. Spead to 1/2 in thickness. Cover with additional paper towels and allow it to sit for 5 minutes. 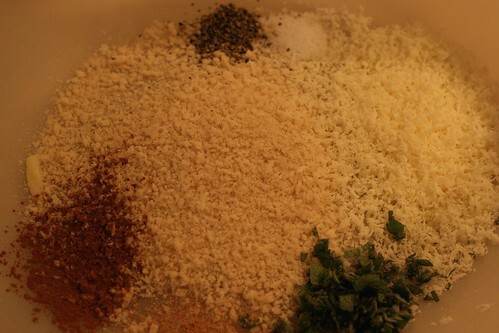 In a medium bowl, combine: breadcrumbs, asiago cheese, salt, pepper, cinnamon, nutmeg and sage. Scrape the pumpkin off the paper towels into the bowl. Combine all ingredients. 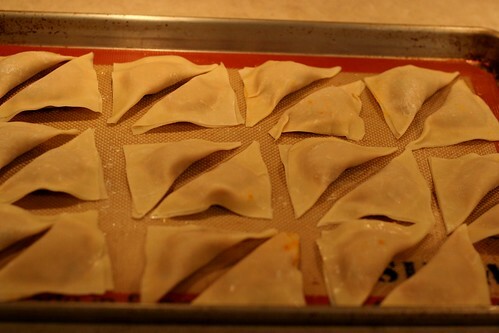 Working with 1 wonton wrapper at a time, spoon 2-3 teaspoons of filling into the center of the wrapper. Brush edges with water, then fold in half, pressing the edges firmly with your fingers. Place on a baking sheet while you make the rest. Fill a large pot with water, bring to a boil. Add ravioli to pot in batches of 6-8. 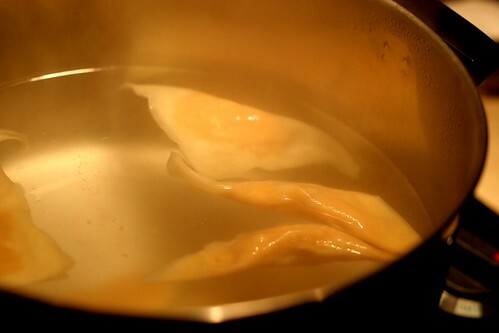 Cook 4 minutes or until raviolis float to the surface, stirring gently. Remove raviolis from water with a slotted spoon, and keep warm. Repeat for all. To make the cream sauce, combine milk and flour in a small saucepan, stirring with a whisk. Bring to a boil, cook for a couple minutes until thick, stirring constantly. Do not let the milk burn. Remove from heat and add in butter and cheese. Gently stir until melted. 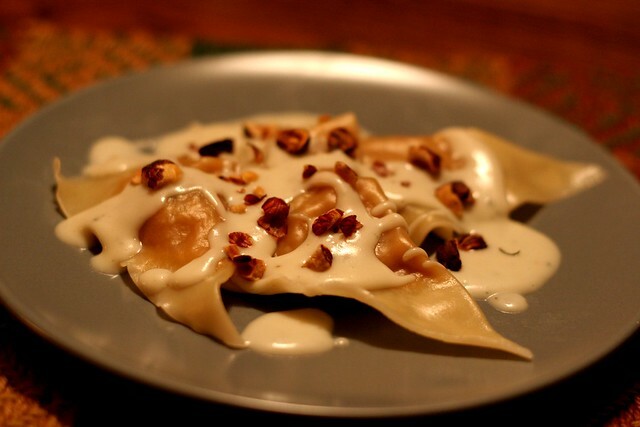 Serve ravioli drizzled with cream sauce, and topped with toasted hazelnuts. OH MY! Beautiful and delicious. You rock! That sounds so good. 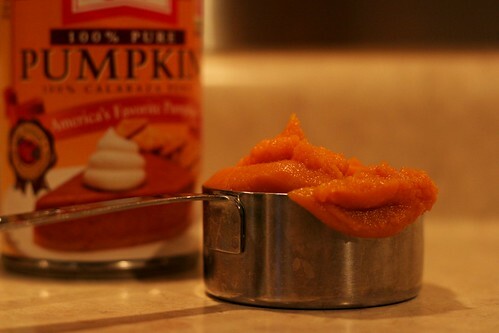 I love pumpkin !! Will be trying these soon! You are a woman after my own heart. Of course you had to fry them! I so would of done the exact same things.